Audio cables are essential for the success of audio recording. Though they are not really the primary things we need, but without them, it is impossible to make things connected. The basic purpose of a cable is to move an electrical signal from one element to another. This has been done without significantly degrading the signal or introducing noise. There are different varieties of cables that are endless. Some of them do have specs and features that are confusing. Audio cables can seem like simple things in concept. While they may be not the most important part of your setup, when you set out to buy one, you may be placed into a realization that there are certain things you didn’t know about the connectors. Preferably, you want to buy cables that are flexible, durable, high-quality, well-soldered and sufficient in length. How are you going to use them? Do they have specific purposes? The fact that many people don’t have much idea what cables they are purchasing and how they actually work is a real life dilemma. So here is what you need to know. There are several different cables in the world but we’re going to focus on the 5 common ones. Understanding them surely eliminates hassles when shopping. Get up and help yourself oriented with different audio cablings. The Musical Instrument Digital Interface or MIDI cables are used to connect keyboards. They are also used to connect other electronic musical devices to computers. Computers are most often equipped with USB and possibly equipped with FireWire connectors. These are now the way we could connect MIDI devices to computers with the help of adapters. MIDI can also be used for Ethernet and WIFI (LAN), Bluetooth and deprecated solutions like sound cards. 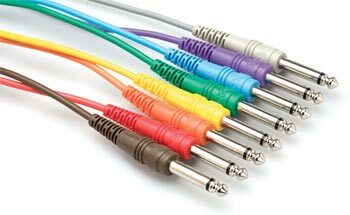 These cables are commonly labeled as “In” and “Out” but they do not work if you use them to connect to the same labeled MIDI ports on an electronic device. Such connection is something like prohibited because the flow of data that the plugs indicate denotes the direction in which data will flow to the computer. The flow is not the port on the instrument to which each cable must be attached. A number of different transports can be used for MIDI messages. How much MIDI data can be carried and how quickly an instrument receives it determines the speed of the transport. RCA or the Radio Corporation of America is the most common type is unbalanced plug and these cables are common for phono connectors. They are used to connect most consumer stereo equipment. Basically, there are tape or CD inputs and outputs using RCA connectors. These connectors are also used for S/PDIF cable connections through S/PDIF is known to be more robust. Long RCA audio cables are often used for connecting different things specifically within the DJ booth. Most inputs on DJ mixers, audio interface, and club mixer are RCA cables. In making the connection, the cable does not have to travel very far so a balanced connection is not a necessity anymore. RCA connections are obviously common for DJ booths since DJ hardware uses these connectors for phono and line levels. Phono level is output by a portable turntable and significantly quieter than the line level. Speakon connectors or speaker cables are used to connect speakers, hence called speakon. Speakon is an unbalanced cable and usually has a much heavier gauge conductor than a patch, instrument or microphone cable. They have bigger wires because they carry much higher voltage signals compared to other cables. They can also be used to connect amps and monitors to PA systems. These connectors are gaining popularity over TS and banana plug connectors because they lock into place. Therefore, they can’t be accidentally disconnected. Speakon cables can have ¼ inches phone, banana clip or the so-called MDP connectors, a binding post which is commonly found on consumer stereo amplifier and speakon or a head amp to securely connect the speaker cabinet. Speakon connectors are originated with Neutrik. You will find a wide variety of them in the market. Speakon connectors are often referred as “twist and lock” connectors but that’s a bit outdated for the manufacturer has made versions that are inserted straight in and can lock with just a little use of release tab. If it is your first time to use them, make sure to determine if the twist and lick motion are functioning. XLR connectors are 3-pin cables: the positive, negative and ground. XLR cables are usually used for transmitting microphone or balanced line-level signals such as mic to speakers and various outputs to powered speakers. They are also one of the two most common types of balanced plug. Cables like this are used as the master audio output from club mixers and some large DJ controllers with built-in audio interfaces. XLR cables are commonly used for microphones as well. XLR cable has the advantage of being very secure because you can use the plug clips and place them into the socket. However, compared to other connectors, they are also quite bulky. People who only have limited spaces in their area may find it hard to store them. But overall, XLR cables work great due to their three-core balanced connection together with their two cables which are needed to transmit a stereo signal. 1/4-inch cables are the most common cables used in the music world. Typically, they have a ¼-inch measurement. These cables are used to connect all manner of audio processing equipment, mixers, consoles as well as other studio essentials. ¼” cables are the standard cables because most instruments are using them for various different purposes. Cables are around us everywhere we turn but we don’t give it any much attention. The importance of cables is certainly buried somewhere but nonetheless, they exist. They are everywhere we look. In this high-tech civilization, we used them, we want it or not. The importance of audio cables is beyond compare. Our homes are wired with several of them. Wherever we live, whatever we use – we need them.